is a story about a girl and a horse: two remarkable individuals who share the same name and a mystical connection that has inspired millions of people. Two days before her 1st birthday, Alexandra (“Alex”) Scott was diagnosed with an aggressive form of childhood cancer. Bravely fighting her disease, enduring chemotherapy, radiation and surgery, the little girl’s positive outlook and courage inspired everyone around her. That would be an inspiring story in itself. But that was not the end of the story. kid’s project—a front-yard lemonade stand—but unlike most, she raised $2,000 in a single day. Soon, Alex’s friends joined in to help, opening lemonade stands in her name. Word spread about Alex’s dream of raising $1 million for pediatric cancer research. On June 12, 2004, she raised nearly $40,000 in three hours at her lemonade stand, while supporters nationwide raised $220,000 in one day at hundreds of Alex’s Lemonade Stands nationwide. With additional donations from corporate sponsors, Alex was more than halfway to her goal of $1 million. Just a few weeks later, on July 29, 2004, Alex’s family gathered at her Philadelphia area home to say goodbye as she finally lost her battle with cancer. Only 8 years old, she had become a hero and inspiration to millions. But even that was not the end of the story. Alex Scott was gone, but her lemonade stand and her dream lived on. Friends continued to work to achieve Alex’s goal. And even as she was dying, another story was beginning, which will forever be linked to hers. 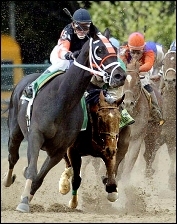 That same day, in Saratoga Springs, New York, a young Thoroughbred horse won his first major race, the Sanford Stakes. 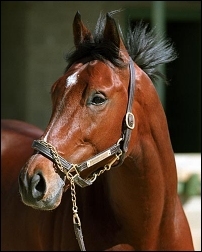 His name was Alex, too: Afleet Alex. 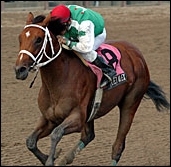 It was clear from his impressive victory that Afleet Alex was no ordinary racehorse, but a potential champion. Gifted with unusual stamina, intelligence, and athletic grace, the plucky little horse won races, a growing number of fans, and media attention. Afleet Alex knew what it was like to fight for life. At birth, he was given little chance of survival when his mother was unable to produce milk, depriving him of critical colostrum needed to fight infection. For two weeks he was bottle-fed by breeder John Silvertand’s 9-year-old daughter Lauren. Against the odds, Afleet Alex survived and grew strong. Overlooked by racing’s elite, he was purchased for a bargain price by a group of five Philadelphia friends buying their very first racehorse. When Afleet Alex’s career took off, no one was more excited than Silvertand. Diagnosed with colon cancer, and given only two months to live, Silvertand elected to discontinue chemotherapy and leave it “in God’s hands” so that he could fully enjoy Afleet Alex’s triumphs. “The horse keeps me going,” Silvertand told the Associated Press. “I truly believe he’s helping me in my battle.” Silvertand has now survived nearly three years since his diagnosis. That in itself would be an inspiring story. But the story did not end there. When the owners of Afleet Alex heard the story of Alex Scott and her lemonade stand, they thought of their friend John Silvertand and his fight against cancer, and knew right away that they wanted to use the colt’s star power to benefit the cause of cancer research. Chuck Zacney, the managing partner, announced that every time Afleet Alex did well in a race, they would donate a portion of his winnings to Alex’s Lemonade Stand. They also donated profits from the sale of Afleet Alex gear, and used the colt’s popular website and media interviews to promote Alex’s Lemonade Stand. They even convinced the racetracks where Afleet Alex was appearing to sponsor Alex’s Lemonade Stands. The Kentucky Derby, the Preakness, and the Belmont Stakes all featured Alex’s Lemonade Stands, spotlighted by NBC and ESPN. On Belmont Stakes Day, 30 racetracks throughout the U.S. held stands in her name, raising tens of thousands of dollars. Helped by Afleet Alex, Alex Scott’s dream of raising $1 million to benefit pediatric cancer research has now exceeded $2 million. Alex’s Lemonade Stand Foundation has funded dozens of grants that are helping researchers fight childhood cancer. But even that is not the end of the story. The public seemed to agree. 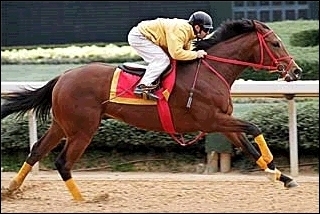 Afleet Alex was the favorite for the historic Preakness Stakes. The race seemed to unfold perfectly. Jockey Jeremy Rose and Afleet Alex waited patiently toward the back of the pack, saving energy. Then with just a nudge from Rose, the colt unleashed a furious burst of speed at the top of the stretch. But just as Afleet Alex was sailing into the lead, another horse suddenly, unexpectedly shied outward, directly into Afleet Alex’s path. His legs tangled with Afleet Alex, who tripped and went to his knees. The colt’s nose was in the dirt, and Rose seemed about to pitch forward to the ground. I was gasping in horror with millions of others. I had seen such accidents before: with the speeding horses behind him unable to swerve in time, Rose would surely be trampled; other equine and human bodies would be flying as they collided with the wreck, injuries and death almost certain. Oh no, no, no, I thought. Not Afleet Alex! The potentially horrific scene seemed to play out in slow motion. Incredibly, Afleet Alex did not fall. In a remarkable feat of athleticism, he somehow pulled his half-ton frame upright. Then, to everyone’s amazement, he recovered his stride and kept running. The astonished crowd roared as Afleet Alex, unhurt but clearly incensed, surged ahead and won the race by nearly five lengths. That moment will go down as one of the most remarkable in horse racing’s history. Three weeks later at the Belmont Stakes, along with tens of thousands of racing fans across the nation, I made a donation and enjoyed a glass of lemonade at Alex’s Lemonade Stand. I could hardly wait to see what Afleet Alex would do next. He did not disappoint. I got goosebumps as Afleet Alex powered to the lead with a dramatic rush. As the courageous little horse sped past me on the way to a seven length victory, I shouted, “Fly, Alex, fly!” I’m not sure which Alex I meant. The little girl, Alex Scott, was loved by people everywhere who were inspired by her courage and her will to live. The little horse, Afleet Alex, is loved by people everywhere who are inspired by his courage and his will to win. “I’ve received letters from people who say when they watch this horse run it literally brings tears to their eyes,” says Ritchey. I am among them. And as the story continues, as Afleet Alex races on, with every glass of lemonade I drink this summer, I will know that I am participating in a miracle. © 2005 Martha Ainsworth. All rights reserved. This story originally appeared on Beliefnet, June 2005.